How much does it cost to get by? Most of us would like to earn more in order to buy all the things we'd like to buy and to be able to fund all our financial goals -- such as a comfortable retirement or college educations for our children. Many of us, though, are trying to buy all we want even when we don't have the money for it. So what does the typical household spend on healthcare? Well, it's a hefty sum, as you probably would have suspected. It's $4,612, to be specific, according to the Bureau of Labor Statistics' 2016 Consumer Expenditure Survey. That includes the health insurance, medical services (such as doctors, hospitals, etc. ), prescription drugs, and various medical supplies. Whatever you're paying for your healthcare, know that there are probably some ways to spend less, such as using Health Savings Accounts (HSAs) or Flexible Spending Accounts (FSAs), shopping around for the best prescription prices (and opting for generics whenever possible), and being smart about Medicare. Housing, of course, is another major expense, and for many people, it's their biggest spending category. According to the Bureau of Labor Statistics' 2016 Consumer Expenditure Survey, the average household spends $18,886 annually on housing overall -- a figure that includes mortgage or rent payments, property taxes, maintenance, utilities, furnishings, and more. A general guideline is that we should aim to spend no more than about 30% of our gross income on housing -- which includes related expenses such as utilities, taxes, and maintenance. When you go house-hunting, keep this guideline in mind and consider aiming for 25% or less, in order to not get stretched too thin. Let's focus just on your home now. What does the average household spend on a home? Well, according to U.S. Census data, the average sale price of new homes sold in June of 2018 was $363,300. Note that averages can skew high or low if there are some extremely high or low numbers in the bunch, such as some multimillion-dollar mansions. 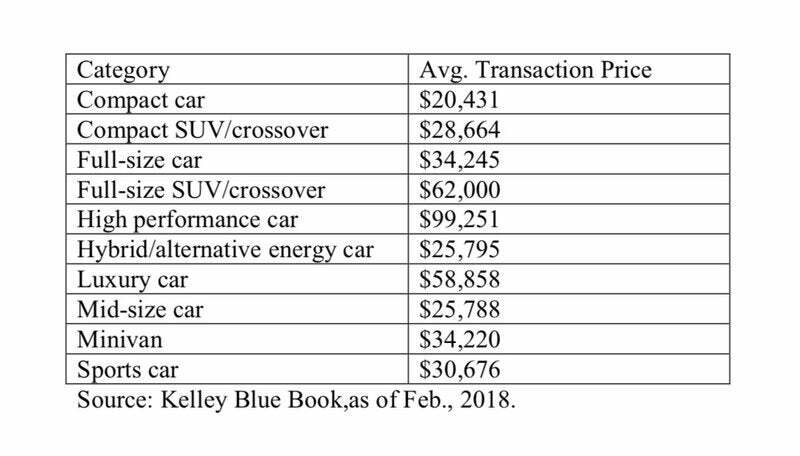 So consider the median sale price instead, $302,100, which reflects the middle price, if you lined up all the prices in ascending or descending order. Meanwhile, the median home value in the U.S. was recently $217,300, according to the folks at Zillow. How does your home compare to that? Spending categories don't get much more essential than food, and the typical American household lays out $7,023 annually on it, according to the Bureau of Labor Statistics' 2016 Consumer Expenditure Survey. Some of that is food prepared at home and some is food purchased at restaurants. The survey breaks down the total into $4,049 for food at home and $3,145 for food away from home. Note how relatively close the numbers are, despite the fact most people tend to eat most meals at home. That reflects the higher cost of eating out and is a good reminder that we can save significant sums by preparing more of our own meals at home. Another key spending category broken out by the Bureau of Labor Statistics' 2016 Consumer Expenditure Survey is alcoholic beverages. The survey found American households spending an average of $484 annually on these drinks. That amounts to about $40 per month -- how does your own spending compare to that? Remember that plenty of people don't drink much or at all, so for those who do drink, the annual sum is likely considerably higher, while it's closer to $0 for lots of people. The 2015 National Survey on Drug Use and Health, for example, found that only 56% of respondents reported that they drank alcohol in the past month. Of course, Social Security taxes are just one of many taxes Americans pay regularly. Personal taxes, which include federal income tax as well as state and local taxes, cost the average household $10,489, according to the Bureau of Labor Statistics' 2016 Consumer Expenditure Survey. Of that, $8,367 is represented by federal income taxes. Fortunately, there are ways that you can shrink your tax bills, at least some -- such as by making use of tax-advantaged retirement accounts (such as traditional and Roth IRAs and 401(k)s), 529 plans for college savings, and Health Savings Accounts (HSAs) and Flexible Spending Accounts (FSAs). Education is a major spending category for many Americans and not so much of one for many others. Overall, though, the average household spends $1,329 on it annually, according to the Bureau of Labor Statistics' 2016 Consumer Expenditure Survey. That may seem minor, but remember that it's an average. Those facing college tuition costs these days may not be surprised to learn that the average cost of tuition and fees for the 2017–2018 school year was $34,740 at private colleges, $9,970 for state residents at public colleges, and $25,620 for out-of-state residents attending public universities, per the College Board. College is costly, so if you're facing these expenses it's best to have a good strategy, such as making use of 529 plans, Coverdell Education Savings Accounts, and/or custodial accounts. Next up are personal care products and services. After all, haircuts and soap are rather essential, aren't they? The average annual cost of such items per household is $707 (about $60 per month), according to the Bureau of Labor Statistics' 2016 Consumer Expenditure Survey. You can reduce the costs at least a little by buying items when they're on sale, loading up at discount warehouse stores, and perhaps favoring your neighborhood salon instead of that fancy downtown one with the $150 haircuts. Clothing is generally not optional in life, so this is another expense we face -- and the average household spending on clothing and related services (such as tailoring and dry cleaning) is $1,803 annually, according to the Bureau of Labor Statistics' 2016 Consumer Expenditure Survey. That amounts to about $150 per month. If a little self-reflection reveals that you do a fair amount of shopping out of boredom or for entertainment, you may be able to save some meaningful dollars by aiming to only buy items of clothing that you really need. One spending category that totals more than clothing and personal care products combined is entertainment. The average annual household spending on it is $2,913, per the Bureau of Labor Statistics' (BLS) 2016 Consumer Expenditure Survey. That figure includes entertainment at home (such as cable TV) and entertainment away from home, such as going to the movies or concerts or sporting events. The BLS includes pets in this category, too. It's a hefty total, but it's not surprising when you consider that the average movie ticket was recently $9.16, while the average cable and satellite TV bill was recently around $101, totaling about $1,200 annually and up some 53% over the past decade. One effective way to reduce this spending is to quit your cable company and just stream your video entertainment. There are lots of options, such as Netflix and Amazon.com's Prime Video, and subscribing to several streaming services can total $50 or less per month while offering gobs of content. Newspapers may be struggling in these digital days, and physical books have to compete with e-books now, but people are still reading, one way or another. The average household spending on reading is $118 annually, according to the Bureau of Labor Statistics' 2016 Consumer Expenditure Survey. That would include not only books, but also newspapers and magazines. It's a low number, to be sure, and it's just an average, meaning that half of households spend even less than that, while the other half spends more. Some who spend very little may still be reading a lot, but doing much of it for free, online. The Pew Research Center has estimated that total U.S. daily newspaper circulation (for print and digital versions combined) in 2017 was 31 million for weekday issues and 34 million for Sunday issues, down 11% and 10%, respectively, from 2016. The news isn't all bad, either, as both The New York Times and The Washington Post have been seeing circulations rise recently. Transportation is another major expense for many Americans, whether it's your car and its fuel, maintenance, and repairs, or your commuting costs. The average annual cost for an American household is $9,049, according to the Bureau of Labor Statistics' 2016 Consumer Expenditure Survey. The U.S. Census Bureau has pegged the average commute at 26 minutes, while the Citi ThankYou Premier Commuter Index estimates that the average annual commuting cost is $2,600. If you take a look at your own transportation costs and you're appalled, consider reining in that spending by car-pooling, reducing your household vehicle fleet by one, taking more public transportation, or some other methods. It can even be worth investigating whether you can work from home one or two days a week. Only about 15.5% of Americans smoke, per the Centers for Disease Control and Prevention. But for those who do, it can be a very costly habit. The cost to the average American household is $337 per year, according to the Bureau of Labor Statistics' 2016 Consumer Expenditure Survey, but that presumably includes plenty of non-smoking households, bringing down the average. If you smoke, it's really worth spending a little time to see what the habit is costing you -- because it's not just costing what you pay for each pack, but also what that money could have done for you. For example, a pack of cigarettes costs $8 or more in many places, so stopping a one-pack-a-day habit would save you almost $3,000 -- or more -- plus what that money could have grown to, if invested instead. Americans set a record for charitable giving in 2017, giving away more than $400 billion. How much did you give away, and how does your giving compare with others'? Well, the average annual household spending on charitable contributions was recently $2,081, per the Bureau of Labor Statistics' 2016 Consumer Expenditure Survey. On top of getting satisfaction from helping others, you can also get some tax breaks from contributions to qualifying charities, via deductions. For example, if you donate $3,000 to charity and you're in a 24% tax bracket, you're looking at avoiding paying taxes on $3,000, saving yourself $720. It's win-win! "Miscellaneous includes safety deposit box rental, checking account fees and other bank service charges, credit card memberships, legal fees, accounting fees, funerals, cemetery lots, union dues, occupational expenses, expenses for other properties, and finance charges other than those for mortgages and vehicles." This is a hard category to use to compare yourself against others, but here's a way to make it useful: If you break out your own spending into what you think are all your main categories -- housing, transportation, food, clothing, etc., and you still have a lot left in "miscellaneous," then you might want to spend some more time breaking that last category down further. You might find, for example, that you spend a lot on postage or on lawn care, and you might identify some spending that can be reined in. There are charitable gifts and then there are gifts you give to loved ones and others -- just because you want to or maybe because you feel you should. These may be birthday gifts, holiday gifts, wedding gifts, graduation gifts, or spur-of-the-moment gifts. The average spending per guest on wedding gifts was recently $106, per the folks at nerdwallet.com, while average Valentine's Day spending for a significant other was recently $89. Research from finder.com has the average American spending $124 on Mother's Day gifts, while the National Retail Federation pegs Father's Day spending at $133, on average. Of course, holiday season gifts are a huge subcategory here, recently totaling, on average, about $906, per the folks at statista.com. Whatever you spend on gifts, you may be able to reduce that sum if you mix in some hand-made gifts or look for thoughtful and unusual -- and inexpensive -- items and experiences. Average vacation costs (including transportation, lodging, food, and entertainment) for a four-day domestic trip were recently $581 (or $144 per day), per valuepenguin.com, while a 12-day international trip averaged $3,251, or $271 per day. Baby Boomers expect to take four to five leisure trips in 2018, spending a total of about $6,400, per AARP Research. About three-quarters of Americans have gone into debt to pay for a vacation, averaging about $1,108 of debt, per the 2017 LearnVest Money Habits and Confessions Survey. The same survey found that Americans were spending, on average, about 10% of their incomes on vacations, with a quarter of Americans reporting spending 15% or more. Clearly, this is a costly category for many of us. You might manage to spend less if you favor domestic travel more and/or opt to visit various destinations during off-seasons, when crowds and prices are smaller. Another way to keep travel expenses in check at least a little is to make the most of a travel-focused credit card, which can help you earn discounts, miles that can be applied to tickets, and various other perks. Some of the best travel cards even offer sign-up bonuses worth hundreds of dollars. If you're being charged 30%, you're looking at an annual expense of $2,700 -- just for interest. It's hard to make progress in paying down debt when you're paying so much in interest. Fear not, though, it is possible to pay off your debt -- even lots and lots of debt. Bank fees are a stealth expense in many cases. They recently averaged about $329 annually, per Chime Bank's Bank Fee Finder Summary Report, and many get charged without customers noticing. For example, your bank may be charging you for receiving statements in paper form, for redeeming reward points, for returned mail, for not maintaining a minimum balance, and even for "inactivity" -- for not using your account much. Fortunately, there's no law saying you must stick with your bank. Switching banks may be a pain, but find one with lower fees and you can save thousands of dollars over many years. One good place to start is with some local credit unions, as they often offer better interest rates and lower fees. A good way to reduce spending in this category is to drive your car longer before buying a new one, and to consider buying a used or slightly used car instead of a new one when you need a new set of wheels. Taking good care of the car you have and getting it serviced as recommended can also extend its life. One way to keep pet healthcare costs in check a bit is with pet insurance, if it makes sense for your pet and your budget. The average U.S. household spends $3,160 on health insurance, per 2016 data from the Bureau of Labor Statistics. The average American spends about $900 annually on car insurance, according to the folks at InsurancePanda.com. The average cost of homeowners insurance is $1,083 annually, per ValuePenguin.com, which pegs the average cost of renters insurance far lower, at a mere $187. The average non-smoking American pays $2,037 annually for a $500,000 term life insurance policy, while smokers fork over an average of $7,313. Whole life policies tend to cost around $3,000 more per year than that, per CreditDonkey.com. Of course, where you live and your personal particulars can leave paying rates far higher or lower than the averages above. Beyond that, look into reducing your insurance bills by calling around for the best rates every year or two and hiking your deductible (as long as you can still afford to pay it if need be). Bundling your policies with the same insurer can yield extra discounts, too. ALSO READ: Who's Ready for a 15% Increase to Their Health Insurance Premium in 2019? John Mackey, CEO of Whole Foods Market, an Amazon subsidiary, is a member of The Motley Fool’s board of directors. Selena Maranjian owns shares of Amazon, Netflix, and Zillow Group (C shares). The Motley Fool owns shares of and recommends Amazon, Netflix, Zillow Group (A shares), and Zillow Group (C shares). The Motley Fool has a disclosure policy.